UK angler Ray Hughes returned to the highly prolific IT Lake Monsters in Ratchaburi on another Thailand predator fishing tour. 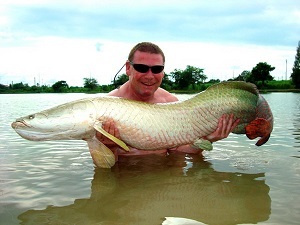 After previously capturing two massive Arapaima gigas in a single days fishing at IT Monster to 110kg’s, Ray was keen to hook another large Amazonian predator! Choosing to fish with deadbait tactics the angler was soon catching hungry predators with several good Redtail Catfish with weights to 26kg’s. Ray fished to several prebaited areas at various parts of the lake with large mackerel fillets mounted onto Owner hooks with 100lb Fluorocarbon hooklinks. After a short lull in the action Ray’s deadbait was picked up by a slightly larger predator. After initially taking 30 yards of line in the first run the angler clamped down hard on the reel causing the fish to change direction. The fish performed a series of extremely powerful runs each time stripping line from the angler’s reel. After a dogged fifteen minute battle a crimson colored tail broke through the surface layers some ten yards from the bank. As the Arapaima languished on the surface Boy expertly netted the Amazonian predator before paddling back to the lakeside. After carefully removing the hook with forceps the fish was quickly photographed before being slipped back into the lake. A weight of 40 kg’s was placed on the Arapaima. After rebaiting the rods and recasting to yet another marginal hotspot it wasn’t long before the angler was into more toothy predators. Throughout the afternoon Ray caught steadily catching a succession of predatory species. Included in Rays twenty five fish catch were Striped Sorubim to 8.5kg’s, Redtail Catfish to 26kg’s, Pacu to 7.5kg’s, Asian Redtail Catfish and several Arapaima to 40 kg’s.